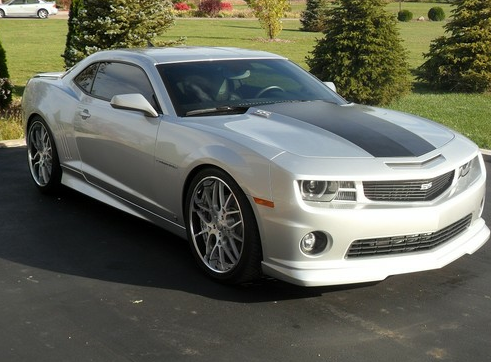 You are looking at a 2010 Supercharged Camaro It Originally retailed for $63,900 and it was built by a company called Rad Rides out of Texas. This car has had around 23,000 dollars worth of add ons some of these include: 22 inch Forgiato Wheels,Nitto tires,Complete G.M. Body Kit Painted to match from front to back,KW Billet adjustible Coilvers on all four Corners,Custom Stainless exaust cat back,Procharger adding 150 Horse Power, This is a beautiful Camaro and a True example of A Modern Day Pro Touring G Machine with lots of Horse Power and Rideabilty to go along with it. This Car has never been Smoked in, and has always been stored in a heated Garage, My wife drove the car to her work a few times, we Attended a couple car shows and thats about it. The car has no stone pecks on the front and shows very few signs of wear at all. The inside of the car still smells new and the seats look like they have never been sat in I urge you to come and check out the car I am Near Lansing Michigan and I would love for any body interested to take it for a test ride.I have taken many pictures of this car and I also took some close up pictures of the front soyou can see how clean it is. This car Has not been on the road since october of 2011. This Car has a perfect clear title and it comes with the Original Brochure From Rad Rides in Texas,Two sets of Keys, And a electonic Programmer by SCT that I have never plugged in($400.00), Feel Free to ask any questions I may be able to deliver the car depending on where your at a $500.00 dposit will be due within 24 hours of the end of the auction This car has also not been driven since October of 2011.